Senate Democrats Visit Obama; Boehner Says Talks Are Over : The Two-Way President Obama hosted the Senate's leading Democrats at the White House for more than an hour Saturday afternoon, in a session that came the same day that Majority Leader Harry Reid met with Republican Sen. Mitch McConnell. Speaker of the House John Boehner leaves after discussing the government shutdown with his fellow Republicans on Capitol Hill Saturday. 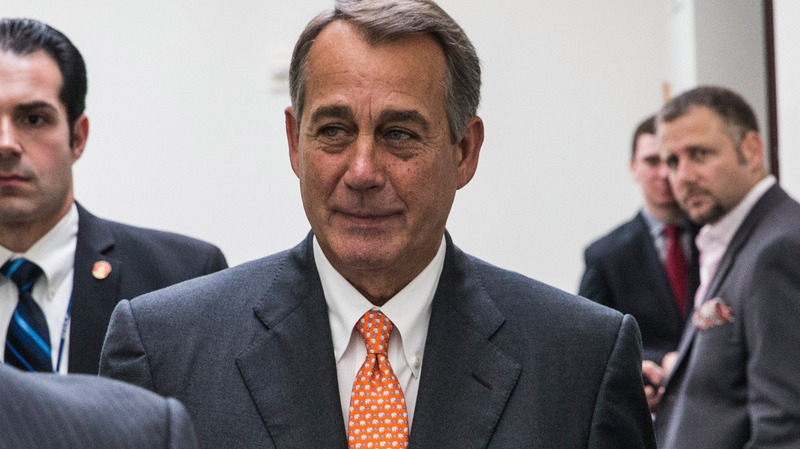 Boehner reportedly told his colleagues that talks with the White House had ended without a deal. President Obama hosted the Senate's leading Democrats at the White House for more than an hour Saturday afternoon, in a session that came the same day that Majority Leader Harry Reid met with Republican Sen. Mitch McConnell. No details were available about the Democrats' discussion, which is one of several lines of communication that are aimed at reaching consensus on a budget deal. Earlier Saturday, House Speaker John Boehner said negotiations with the White House were over, after the president rejected the GOP's most recent plan. Around midday Saturday, Senate Democrats said they didn't support a proposal being drafted by Republican Sen. Susan Collins of Maine. That deal, which was labeled as a compromise, aimed to raise the federal debt ceiling through January. The White House and members of Congress are trying to find a way to end the government shutdown that is now in its 12th day. They also want to raise the federal debt limit, something the Treasury says must happen by Oct. 17 to avoid a potential default. And in the process, Democrats are resisting Republicans' efforts to gut the Affordable Care Act, the nation's new healthcare law. But the law does contain one element that might serve as the crux of a compromise. "Potentially, Republicans may get a two-year delay of the 2.3 percent medical device tax in the law, given the levy's unpopularity even among Democrats," Politico reports. We've updated the top of this post to reflect the most recent news. As it seeks its own solution to the crisis, the Senate blocked a bill backed by Democrats Saturday that would have raised the borrowing limit through 2014. Attention then turned to Sen. Susan Collins, the Maine Republican who has been working to craft a potential compromise solution. After the vote, senators could be seen flocking around her chair on the Senate floor. Collins is expected to speak about her plan in the early afternoon Saturday. "House Republicans met privately this morning, hours after President Obama rejected their plan to extend the debt ceiling for six weeks and start talks on reopening the government. Kansas Republican Tim Huelskamp blames Obama for the shutdown. "'We're waiting for the president actually to make an offer. He has not. Just sitting around waiting doesn't get the job done,' he said. "Meanwhile in the Senate, Majority leader Harry Reid chided his GOP colleagues. "The Republicans are not interested, it appears at this stage, of doing anything constructive to extend the debt ceiling, to open the government. Later — it's what they always say." Citing a congressional aide, Reuters reports that Reid and his counterpart in the Senate, Republican leader Mitch McConnell, met for about an hour on Saturday, at McConnell's request. The ongoing stalemate in Congress led NPR's Ari Shapiro to ask the question today, "Would the U.S. Be Better Off With A Parliament?"